Escape the urban bustle at Palm Cove Beach and Photography Tours. Step off the beaten path and head to Daintree Rainforest - Cooper Creek Wilderness and Opal Reef. Get out of town with these interesting Cairns side-trips: Hartley's Crocodile Adventures (in Palm Cove), Yungaburra (Cathedral Fig Tree & Curtain Fig National Park) and Port Douglas (Safaris, St Mary’s by The Sea chapel, & more). Spend the 15th (Sat) among aquatic life with a scuba or snorkeling tour. Next up on the itinerary: identify plant and animal life at Atherton Tablelands, take in the dramatic scenery at Millaa Millaa Falls, view the masterpieces at Bones and Jones, and take some stellar pictures from Walu Wugirriga Lookout. To find traveler tips, photos, ratings, and more tourist information, refer to the Cairns day trip planner. Brisbane to Cairns is an approximately 5.5-hour flight. You can also do a combination of bus and flight; or drive. In June, Cairns is somewhat warmer than Brisbane - with highs of 30°C and lows of 22°C. Finish up your sightseeing early on the 24th (Mon) so you can travel to Perth. 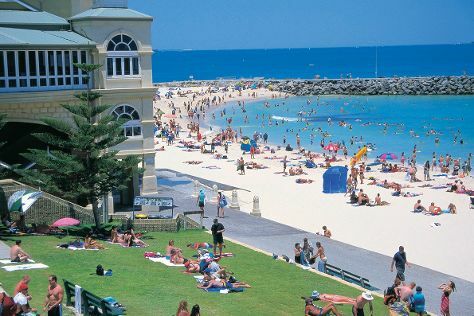 Discover out-of-the-way places like Cottesloe Beach and St. Mary's Cathedral. Do some cultural sightseeing at New Norcia Museum & Art Gallery and Aviation Heritage Museum. Get out of town with these interesting Perth side-trips: Mullaloo Beach (in Mullaloo), Fremantle (Norm wrightson hairway, Fremantle Prison, & more) and Trigg Beach (in Trigg). And it doesn't end there: do a tasting at Hotham Ridge Winery, take in the spiritual surroundings of St. George's Cathedral, steep yourself in history at The Perth Mint, and take in the architecture and atmosphere at St Johns Lutheran Church. To see more things to do, ratings, and more tourist information, read Perth trip builder website . You can fly from Cairns to Perth in 7.5 hours. Alternatively, you can drive; or take a train. The time zone difference moving from Australian Eastern Standard Time (Queensland) (AEST) to Australian Western Standard Time (AWST) is minus 2 hours. Traveling from Cairns in June, you will find days in Perth are little chillier (23°C), and nights are much colder (9°C). Wrap up your sightseeing on the 30th (Sun) to allow time to travel to Melbourne. Get a sense of the local culture at Melbourne Museum and Shrine of Remembrance. Relax by the water at Eastern Beach Reserve and Bells Beach. Explore the numerous day-trip ideas around Melbourne: Split Point Lighthouse (in Aireys Inlet), Ballarat (Lake Wendouree, Art Gallery of Ballarat, & more) and Paramoor Winery (in Carlsruhe). And it doesn't end there: explore and take pictures at Royal Botanic Gardens, contemplate in the serene atmosphere at St Paul's Cathedral, admire the landmark architecture of Royal Exhibition Building, and take in the exciting artwork at Bruno's Art and Sculpture Garden. For ratings, where to stay, maps, and tourist information, read Melbourne route builder website . Fly from Perth to Melbourne in 6.5 hours. Alternatively, you can take a train; or drive. The time zone difference when traveling from Perth to Melbourne is 2 hours. Traveling from Perth in July, you will find days in Melbourne are a bit cooler (15°C), and nights are about the same (6°C). Finish up your sightseeing early on the 9th (Tue) so you can travel to Canberra. 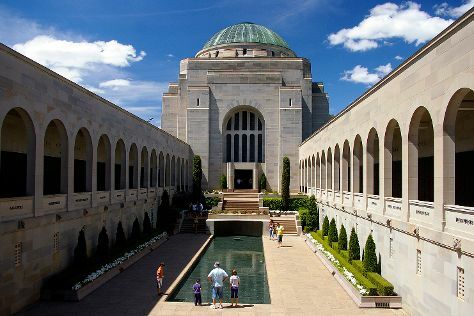 Start off your visit on the 9th (Tue): get engrossed in the history at Australian War Memorial, trek along ANZAC Parade Walk, then admire the masterpieces at National Gallery of Australia, and finally appreciate the extensive heritage of Canberra Rotary Peace Bell. On the 10th (Wed), you'll have a packed day of sightseeing: enjoy unforgettable views with a balloon tour, stop by Kimoyes, then get curious at Canberra Deep Space Communication Complex, and finally brush up on your knowledge of spirits at Underground Spirits. For traveler tips, maps, where to stay, and other tourist information, you can read our Canberra trip maker . You can fly from Melbourne to Canberra in 3.5 hours. Other options are to drive; or take a bus. Expect little chillier evenings in Canberra when traveling from Melbourne in July, with lows around 0°C. Finish up your sightseeing early on the 11th (Thu) so you can go by car to Sydney. You'll discover tucked-away gems like Wentworth Falls and The Giant Stairway. Get in touch with nature at Bondi Beach and Manly Beach. Change things up with these side-trips from Sydney: Shelly Beach (in Manly), Govetts Leap (in Blackheath) and Norman Lindsay Gallery & Museum (in Faulconbridge). And it doesn't end there: wander the streets of The Rocks, take in the spiritual surroundings of Nan Tien Temple, take in nature's colorful creations at Royal Botanic Garden Sydney, and get great views at The Three Sisters. For where to stay, other places to visit, ratings, and more tourist information, refer to the Sydney trip builder website . You can drive from Canberra to Sydney in 3.5 hours. Other options are to fly; or take a bus. Traveling from Canberra in July, things will get a bit warmer in Sydney: highs are around 21°C and lows about 9°C. Wrap up your sightseeing on the 17th (Wed) to allow time to travel back home.